1. Remove the rectangular plastic lens in the front of the roof panel. 2. Turn the cross bolt with a Phillips screw driver counterclockwise to remove the front dome light assembly. 3. 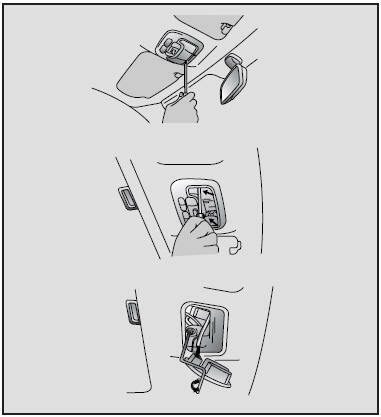 Insert the hex head wrench (provided with the vehicle) into the socket. This wrench can be found in the glove box. 4. Turn the wrench clockwise to open or counterclockwise to close. If you try to open the sunroof when the temperature is below freezing or when the sunroof is covered with snow or ice the glass pane or the sunroof motor could become damaged.